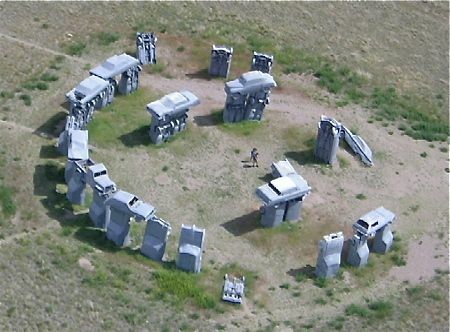 Carhenge is a replica of the 4,500 year old Stonehenge ruin in England. 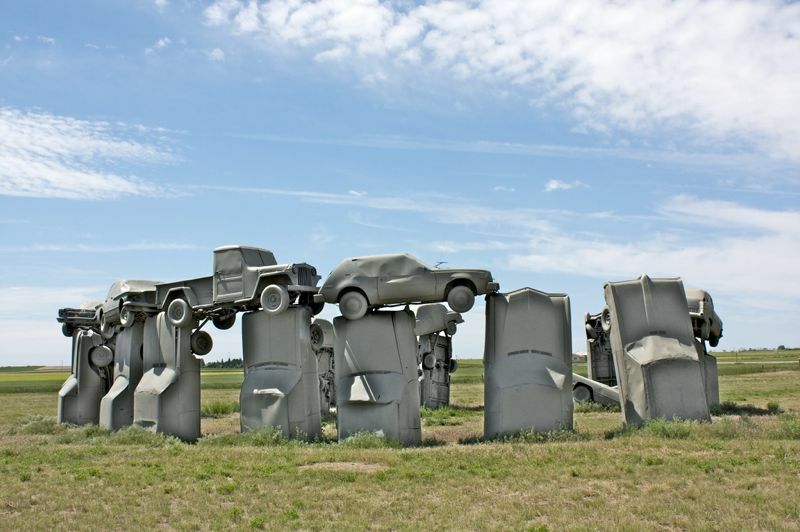 It was built by Jim Reinders in Nebraska, USA, using 38 vintage automobiles spray-painted gray and posed after the original sarsens, lintels, and altar stones of Stonehenge. 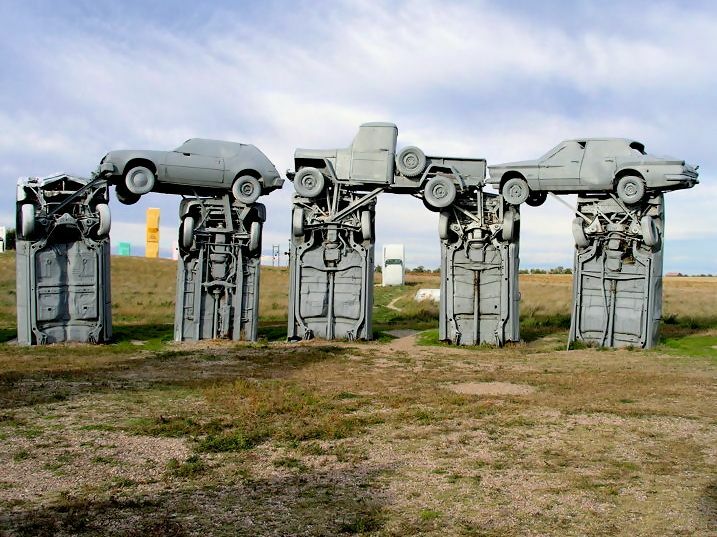 Now the work is surrounded by a ring of ‘portal’ cars, dinosaurs, and giant fish, spray-painted in gaudy colors and forming a wider ‘Car Art Reserve’. Altar ‘stone’. 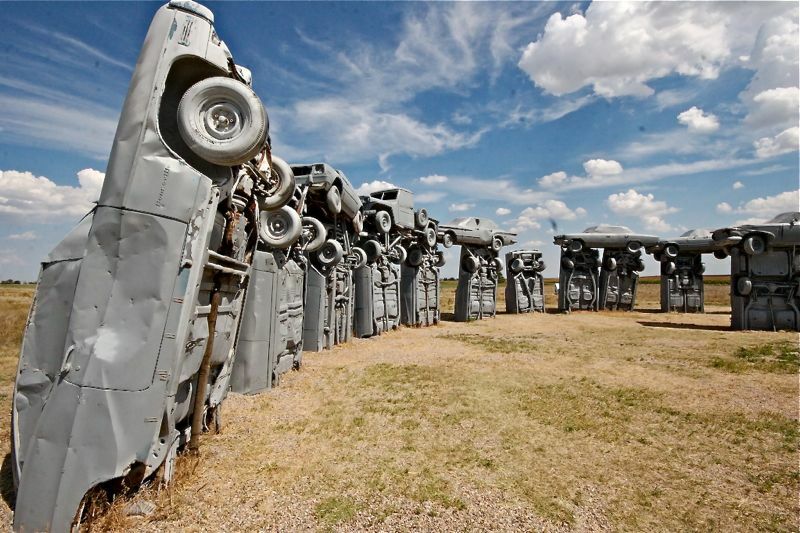 Photo by Jeremy Burgin. 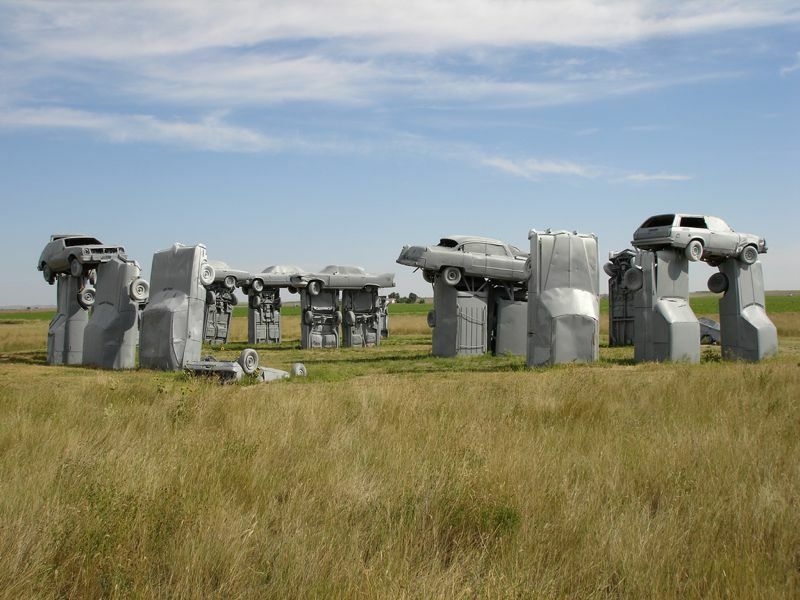 Carhenge replicates Stonehenge’s current “tumble-down” state, rather than the original stone circle erected between 2500 BC and 2000 BC. 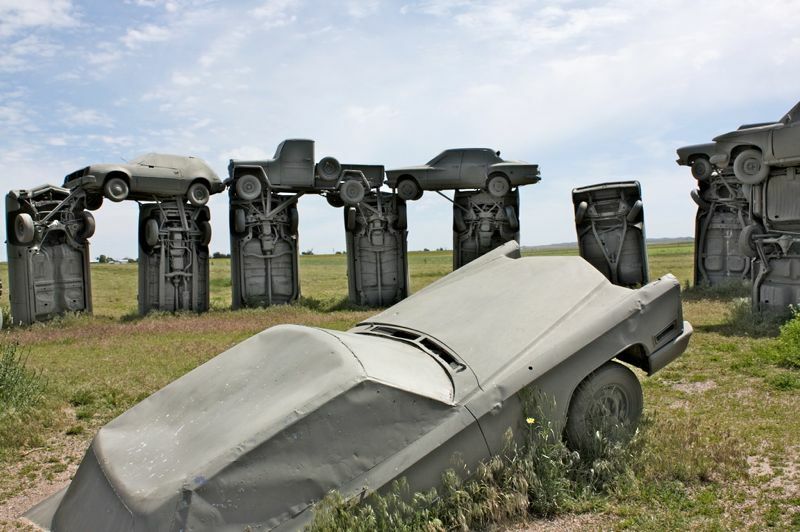 In addition to the Stonehenge replica, the Carhenge site includes several other sculptures created from autos covered with various colors of spray paint. Tumbledown. 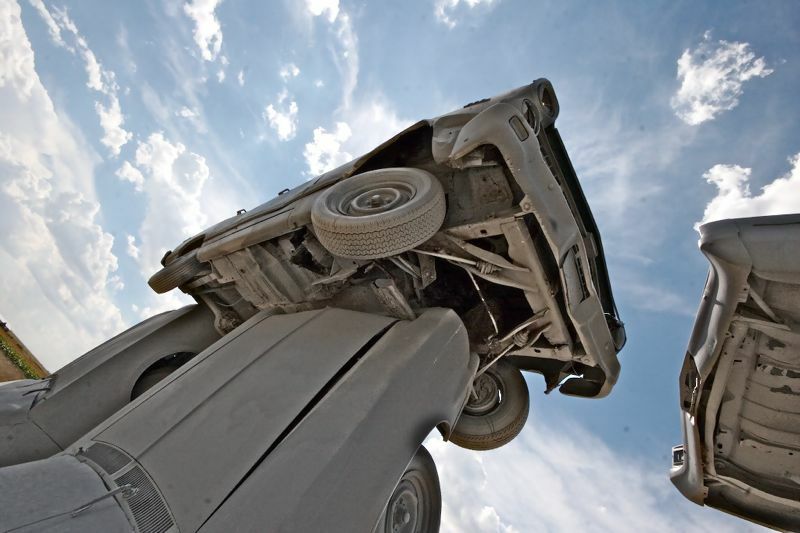 Photo by Jeremy Burgin. Up close with the sarsens. However did they manage to raise such weighty lintels? Photo by Mark Devries. 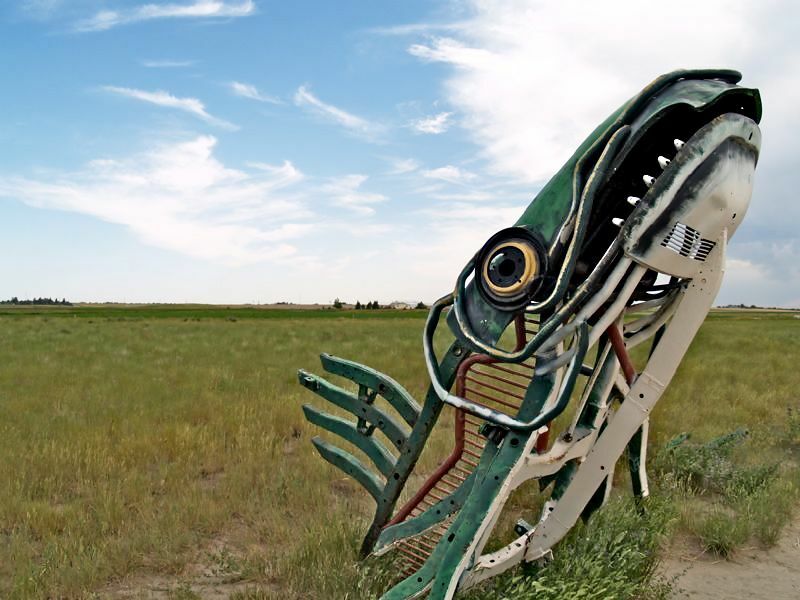 Rearing fish sculpture made from the body of a car, guarding the waters around the henge. 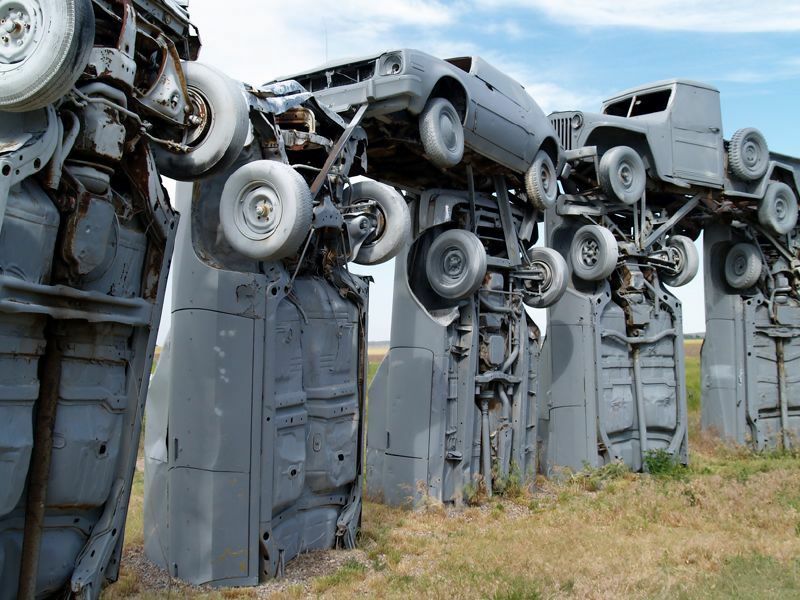 Photo by Mark Devries. 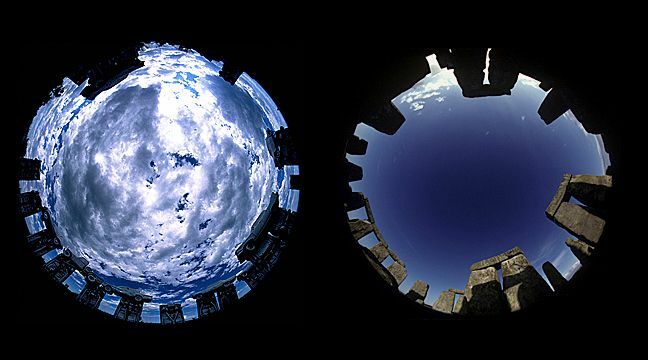 Fish-eye comparison looking up through Carhenge and Stonehenge respectively. ‘The FourD Seasons’. 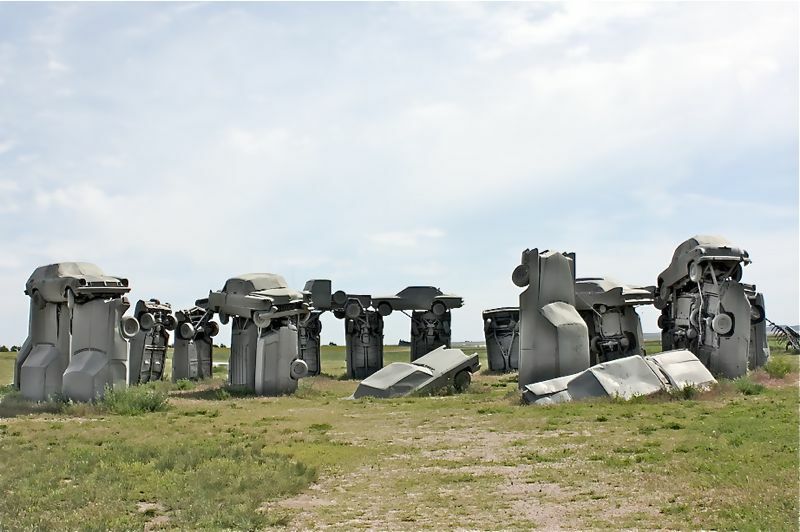 Colorful portal ‘stones’ surround the henge. Photo by Jeremy Burgin. 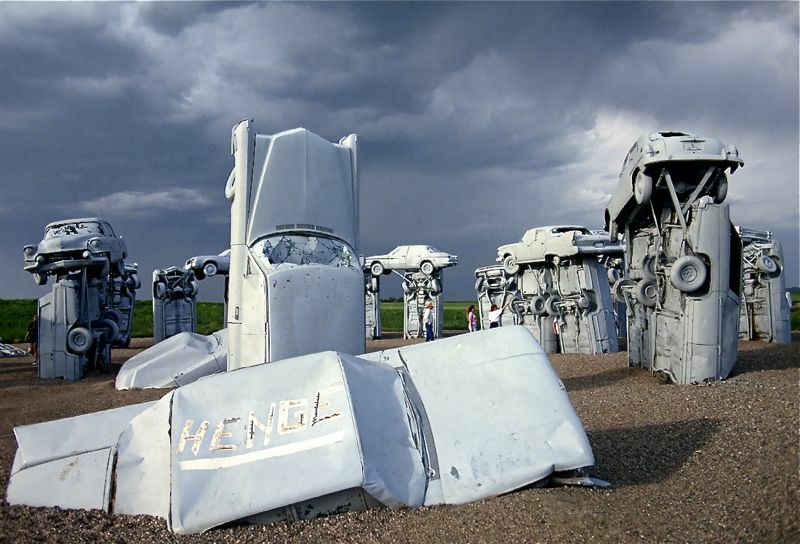 Not part of carhenge- but more car art at Cadillac Ranch, in Buffalo. Photo by n23art. If you liked the intro to this article, a kind of retro futurist look back at our current life as ruins, then you’ll love Neal Stephenson’s latest book- Anathem. It’s a story of secular monks living inside giant millennial clocks- huge Rube Goldberg machines that keep the monks inside and isolated from the evolving outside world for various periods of time, from the single-years to the tenners, hundreders, and thousanders. When their time rolls around the giant clock windings open the gates of their cell, and they head out into the world to share their learnings with a world that has carried on without them. As with most of Stephenson’s work, the plot is not especially strong or gripping. What grabs you instead is the wonderful world he’s built, and the language he has invented to describe it. Recommended. Interesting, I’d like to see that some time. 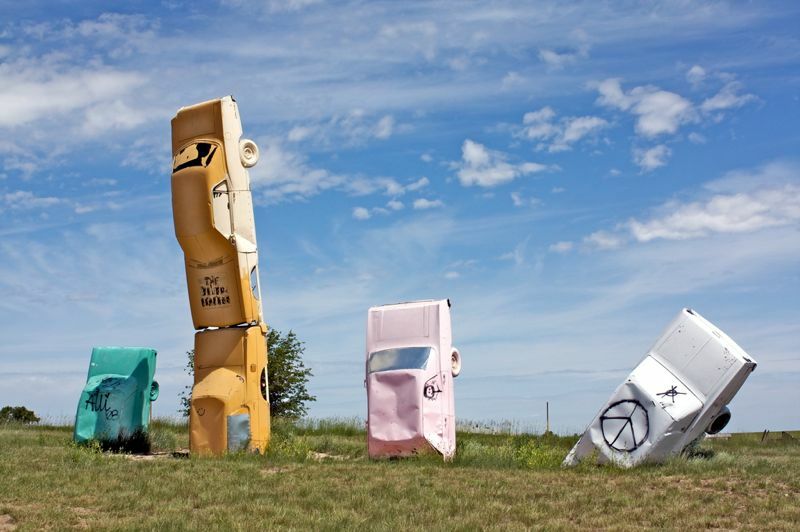 As for Cadillac Ranch, my wife and I happened across that while driving from LA to DC via interstate road I-40 in Amarillo Texas. 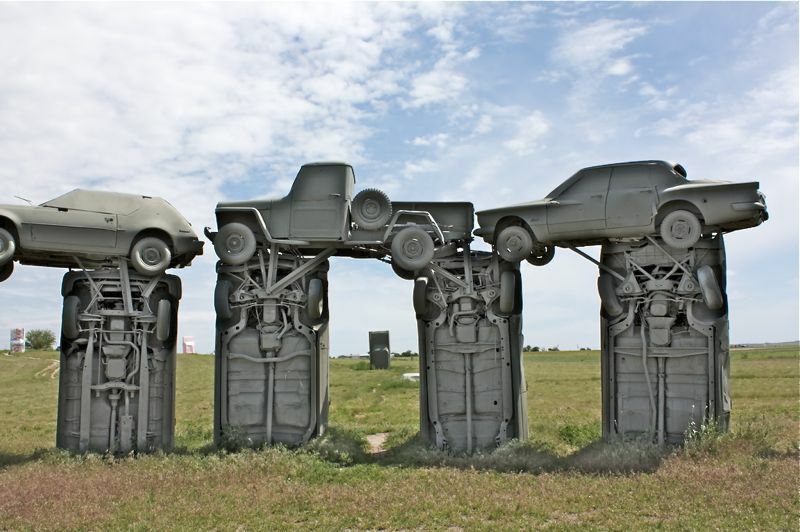 It’s hard to miss, being just a few hundred yards south of the interstate highway and it’s quite an apparition as you’re driving by at 70 mph. 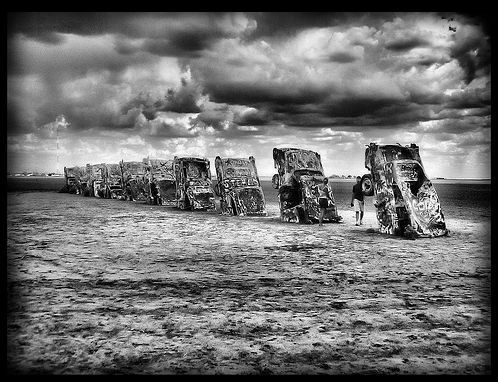 Here’s a good explanation of Cadillac Ranch, and there are lots of photos all over the Internet.